We are happy to tailor your adventure just the way you want it. 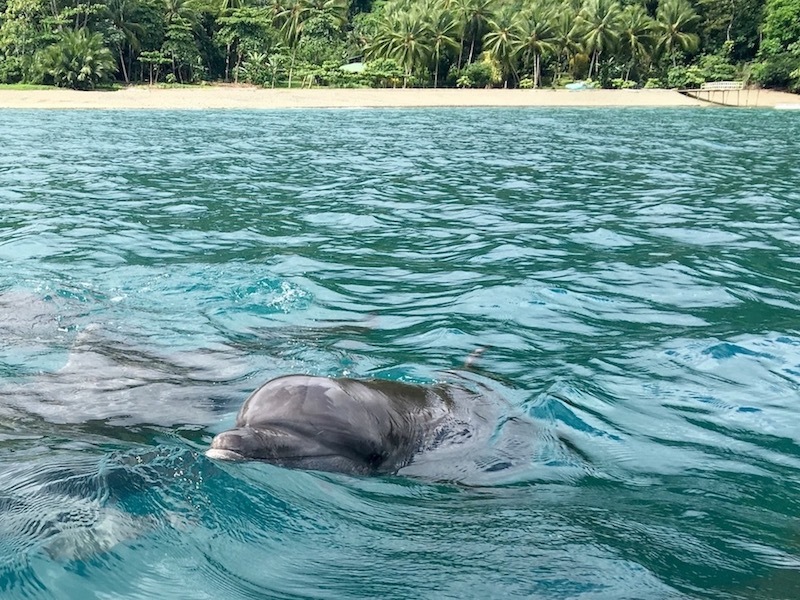 However, based on our own exploration of the gulf, we have designed three different escapades which we believe make the most of visiting Golfo Dulce: Dolphin & Whale Watching, Snorkelling & Picnic and Wild Beach & Cove. Although sightings of dolphins are likely on any of our boat tours, if you would like to maximise your chances of seeing them, we are happy to take you out on our boat just looking for these wonderful creatures - we know their favourite spots for playing and relaxing and their preferred routes where they hunt. Bottlenose dolphins usually travel in small pods of 6-8 members (at times with young ones) and prefer the shallower waters along the coastline; these are highly sociable and curious animals who often chose to interact with our boat and will provide you with stunning photo opportunities. The smaller spotted and spinner dolphins always travel in large groups of 50 to hundreds, usually in deeper waters, and are easily spotted leaping out of water. Even more spectacularly, between August and September, Golfo Dulce becomes a preferred destination for southern humpback whales who chose our calm waters to give birth and nurse their young for a few weeks before heading back to southern polar regions. Whale sightings are therefore possible on any boat adventure during this time of the year, or we can actively go and search for whales if you are a whale lover like us! The waters of Golfo Dulce remain to this day fairly solitary so all whale sightings tend to happen in a very intimate setting, making the experience truly magical. The tour lasts 2-3 hours and costs $65 per person ($45 per child). We require a minimum of 2 adults. 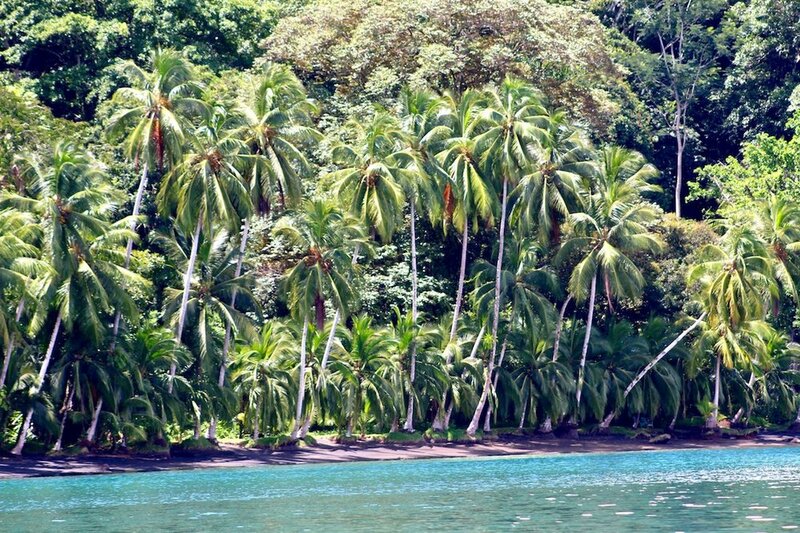 Snorkel in turquoise green waters with primary rainforest hanging over you. Trigger, parrot, puffer, surgeon fish and more can all easily be spotted swimming around the underwater network of lobe corals. Follow this with a picnic on a wild, sandy beach just a short boat ride away. Here the sea tends to be very calm and the water near shore is shallow, therefore this is ideal for families with younger children. Masks, fins, life vests and picnic will be provided. Depending on tides and how long you will want to swim for, the tour will typically last between 2 and 4 hours and costs between $45 and $65 per person ($30-$40 per child). We require a minimum of 2 adults. We will set out around low tide along our beautiful coastline where primary rainforest meets the sea, go past our local colony of brown pelicans (April to November) to reach a small cove whose tiny beach is adorned by oyster shells. Some snorkelling is possible here, with delicate white fan corals and feather stars to be found nearby. Another very short boat ride will take you to a long, palm-fringed sandy beach. Relax amongst its wild vegetation, take long walks, swim in the surf and then cool off in a small stream (March-November). Please note that this tour requires a short swim to the cove/beach and back. This tour is best suited to confident swimmers, lasts 3 hours and costs $55 per person ($30 per child). We require a minimum of 2 adults.